Frozen water pipes are a serious risk during very cold winter weather. When water freezes in a pipe, it expands and can exert pressure at over 2,000 pounds per square inch. This pressure is enough to rupture almost any pipe filled with water, which provides no place for the ice to expand. A ruptured pipe can be a time bomb, since initially there may be no leaking at all since the frozen water may completely block the pipe—until, that is, the ice begins to thaw slightly, at which point you are on the verge of a major flood. There are many instances where homeowners try to escape a cold winter for a few weeks of vacation in a warm climate, only to return to a home that has been devastated by tens of thousands of dollars in damage from water that destroyed walls, ceilings, and floors. A burst pipe can easily spill several hundred gallons of water per hour, and that equates to enormous damage to your home. In a cabinet under a sink (especially when located near an outside wall). Near outdoor faucets (hose bibbs) used to connect garden hoses. Identify the frozen pipe and locate the blockage: Follow the pipe back from the faucet to where it runs through cold areas, such as an exterior wall or unheated crawl space. Look for areas of the pipe that have frost or ice; it may also be slightly bulged or fissured. How you thaw the pipe will depend on where it is located. Turn up the heat in the house and wait. If you suspect the pipe is inside the wall within a bathroom or kitchen sink base cabinet or vanity, make sure to open the door of the cabinet to help the heat reach the wall. Cut out a section of the wall or ceiling to access the frozen section of pipe, then thaw the pipe as an exposed pipe (see next step: Thawing an Exposed Frozen Pipe). Use an infrared lamp to help heat the wall section in front of where you believe the pipe is frozen. Infrared lamps are better than regular heat lamps because they pass through the air without heating it and will direct more energy to warm the wall and frozen pipe. And here is less chance that the infrared lamp will dangerously overheat the wall materials. If the frozen pipe is exposed, such as may be present in an unfinished basement or garage, you have several options for thawing it. Whichever remedy you use, heat the pipe moving from the faucet toward the frozen area. This allows water to flow out as the ice melts. This is usually the easiest and safest way to thaw a pipe. If the pipe is close to the wall, place a cookie sheet behind the pipe to help radiate heat onto the backside of the pipe. You can use an infrared or incandescent heat lamp. As with a hairdryer, if the pipe is close to the wall, use a cookie sheet behind the pipe to help reflect heat onto the pipe. A small, powerful heater works great for warming pipes under a kitchen or vanity base cabinet. Direct the heater onto the frozen section of pipe. It will work like a hair dryer on steroids! Heat tape is a ribbon-like wrap that contains electrical heating elements. You wrap it around the pipe you want to heat and plug it into the wall. The temperature of the tape is controlled with a thermostat. Heat tape can also be used to prevent pipes from freezing in critical areas; you can leave the heat tape on the pipe and plug it in only when needed. Leave the faucet dripping slightly during the coldest time of the day or night. 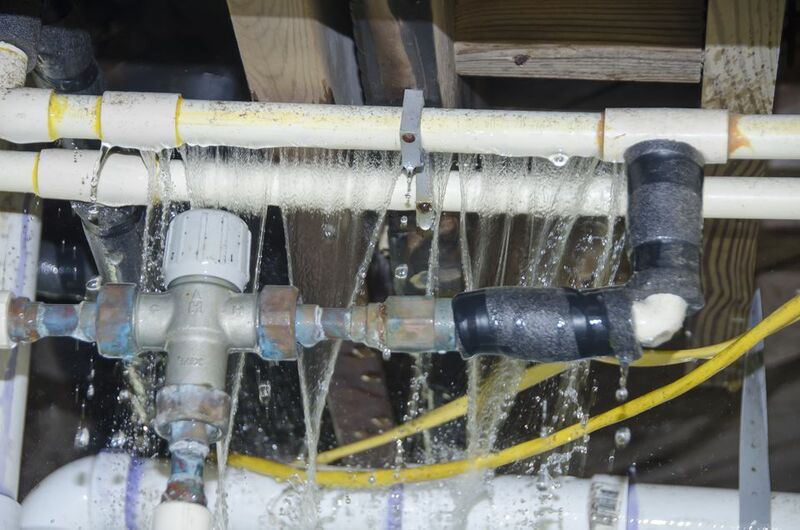 The steadily moving water will keep the pipes slightly above the freezing point and prevent them from freezing. No one wants to waste water, but it is better than dealing with burst pipes. Wrap the problem pipe with electrical heat tape and allow it to run when the weather is especially cold. Remove garden hoses attached to outdoor faucets (hose bibs or sillcocks). If the faucet is not a frost-proof type, turn off the water to the faucet inside the house and drain the exterior section of the pipe and faucet.